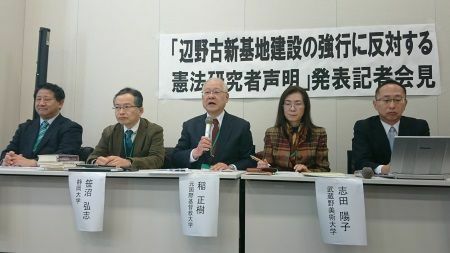 On January 24 at House of Representatives in Tokyo, a group of constitutional scholars announced a statement opposing construction of the new base in Henoko. On January 24 a group of constitutional scholars including former professor Masaki Ina of the International Christian University gathered at the House of Representatives in Tokyo and presented a researchers’ statement opposing the forced construction of the Henoko base. As of January 24, 131 constitutional scholars have endorsed the statement. The scholars who attended the press conference appealed that, “This is a matter of the Okinawan people’s fundamental human rights, and at the same time it is a matter of democracy in Japan. ” They also demanded that construction be halted until the results of a prefectural referendum, which will ask citizens if they support or oppose the Henoko land reclamation, are announced. According to Ina, this is the first time that volunteer constitutional scholars have issued a statement in regard to the Henoko base construction issue. There are 500 to 600 constitutional scholars in Japan. Those endorsing the statement continue to recruit advocates. The statement points out the problem that, “Construction of the new base in Henoko by the Abe administration is a violation of democracy and local autonomy. Ina said, “Construction of the Henoko base is a problem for Japanese citizens. Base construction that overlooks residents’ wishes is contrary to the principle of local autonomy in the Constitution. Professor Yoko Shida of Musashino Art University said, “The opposition of the prefectural people is one way for them to express their will, as guaranteed by the Constitution. It should never be neglected or ignored. In addition to the Cabinet, the Ministry of Defense, the Ministry of Foreign Affairs, the Self Defense Force, the Okinawa Prefectural Government, and other official agencies, the statement will be sent to all political parties. In the future, the constitutional scholars are considering some sort of appeal activism with proponents of the statement.